Showcasing the best of modern building, this beautiful property constructed with the growing family in mind, offers stunning designer touches throughout. A commanding street presence provides the ultimate entry to this JG King built steel framed home. Comprising of four generous bedrooms, all of which are complete with a ceiling fan and walk in robes, the master has direct access to the sleek ensuite featuring a separate toilet, double vanity, large shower and luxurious bath, perfect to unwind after a long day. An additional study is ideal for a studious teenage or office space allowing you to work from home. 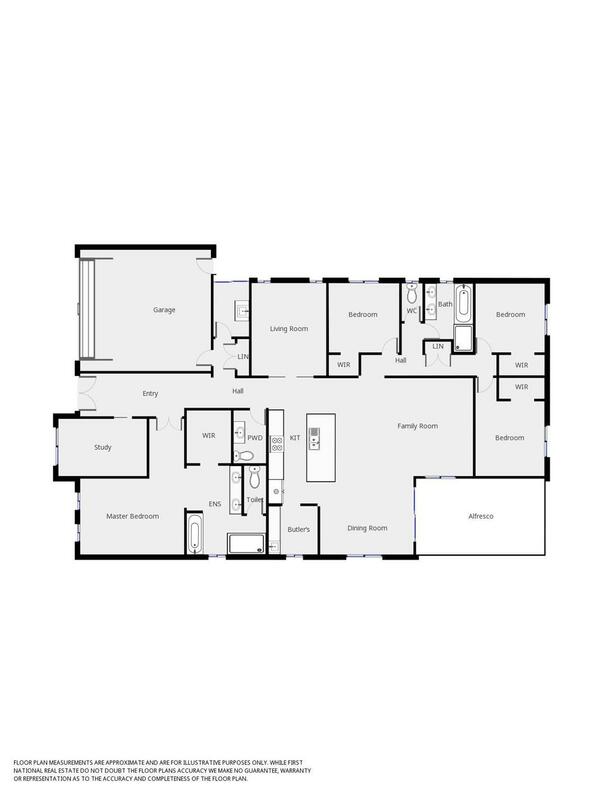 Thoughtfully designated zones provide convenience with a formal lounge ideal for movie nights, and an open plan area incorporating kitchen, meals and family room. The galley kitchen is sure to impress with an abundance of storage options and bench space, with the added features of stone benchtops, 2 ovens and a butler's pantry to complete the impressive package. Flowing naturally from inside to out entertaining will be a breeze with an oversized undercover alfresco overlooking the low maintenance yard, perfect for the kids to enjoy. The double garage provides security for family vehicles with internal access a welcome bonus. Double gates to side of the home allow rear yard access for trailers, boats or caravans. Other notable features include a 5.5kw solar system and double glazed windows providing a 6-star energy rating. Extra height to the internal door and 8.5 ft ceiling allow an abundance of natural light to fill the home. A new lifestyle of luxury and easy living is within reach… make the enviable decision to call this modern family home your own. Book an inspection today!